Comes in both regular and plus sizes. Be sure to select correct size. Hippie clothes. Bohemian clothing. Artsy clothing for expressive women! Retro Regular and Plus Size classic gypsy hippie chick bohemian shabby chic styles for creative women. Handmade boutique styles at affordable prices. 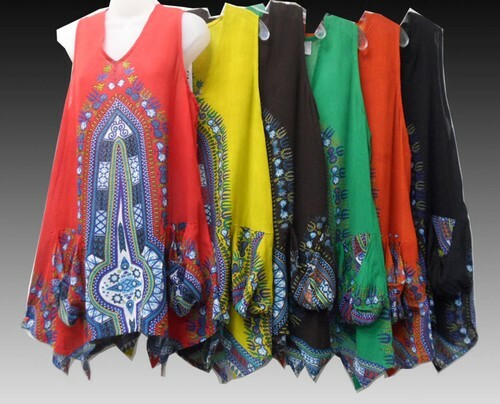 100% Rayon Rasta African Dashiki Print pixie hem top shirt blouse. Traditional Indian shape and design. Fabric has some stretch and very comfortable. Two bunch pockets. This top looks really nice worn with with leggings. Because of the handmade nature of these garments, sizing varies. The measurements here represent an average measure of this garment. Bust measurements are taken with the garment stretched. Check the measurements below.